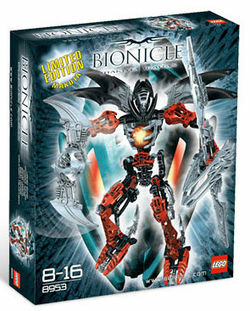 8953 Makuta Icarax is a BIONICLE set released in February 2008. It contains Icarax, a black and red Makuta with a twin sword, rotating blades, the Mask of Shadows, a Tridax Pod, and wings. It was a Toys 'R' Us exclusive set in the US. This is a description taken from LEGO.com. Please do not modify it. (see an archive of the product's page) Warrior of shadow! Icarax is the ultimate winged Makuta warrior! With his twin sword, rotating shadow blades, Mask of Shadow, and Tridax pod, he is ready to crush any Toa opponent! Can any power in the universe hope to stop him? Includes Tridax pod with four shadow leeches! Turn the handle to spin the shadow blades! Icarax stands 10" (25cm) tall! Twin sword measures over 10" (25cm) long! There were two different versions of the Kanohi Kraahkan, one with a six hole chin and one with a four hole chin. Icarax has the mask with the 4 hole chin. Facts about "8953 Makuta Icarax"
This page was last edited on 9 February 2019, at 23:32.